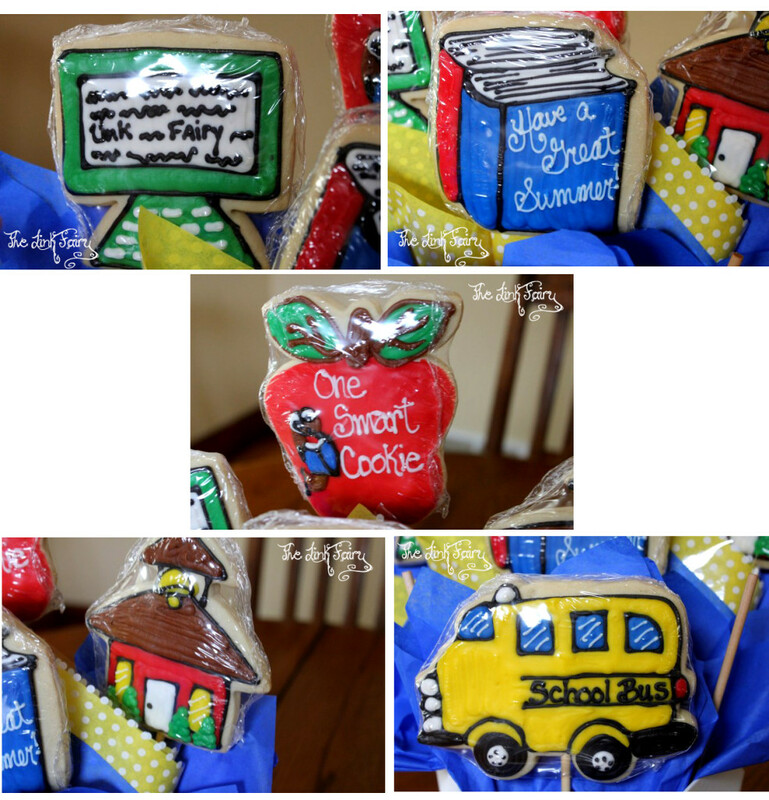 Celebrate Summer & graduation with custom cookie bouquets from Cookies By Design! Thank you to Cookies By Design in Madison, WI for providing me with a sample to review. Summer is officially here!! Vacations are being planned, the weather is getting hotter and kiddos are graduating from school to go onto the next year. 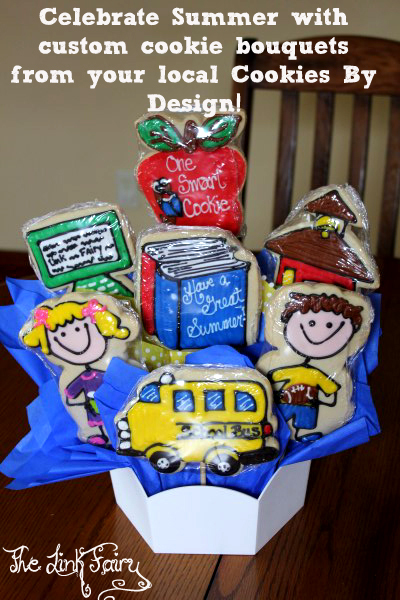 What better way to celebrate the end of the school year and beginning of Summer than with a custom designed cookie bouquet from Cookies By Design! Since 1983 these custom shaped and hand decorated gourmet cookie bouquets have been bringing smiles to people around the nation. I remember the first time I ever saw a Cookies By Design Bouquet, I was in 1st grade and it was sitting on my grandmother’s kitchen table. It was given to her while she was at the hospital and I could never get the picture of those huge cookie flowers out of my head. Their distinct almond taste has stayed with me as my all time favorite cookies! We were given the chance to try out a custom created Cookie Bouquet from Cookies By Design in Madison, WI. Since we are in Green Bay, the bouquet needed to be delivered by courier and I was really surprised that it only took 1 day to arrive! It was hand delivered and safely packed. The kiddos and I were incredibly excited to unwrap the box and see what was inside! 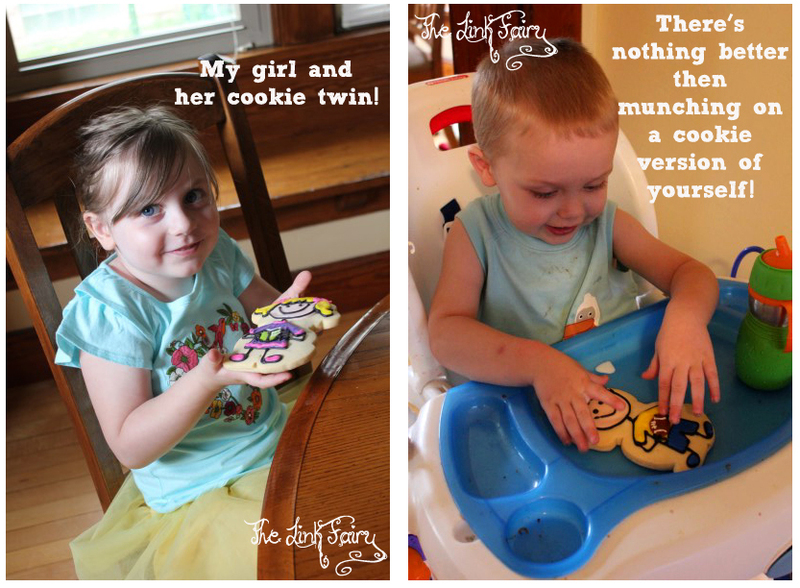 We were pleasantly surprised to find a 7 cookie bouquet featuring fun School’s Out characters AND a custom cookie of both my son and daughter! it was absolutely adorable and my kids were beyond ecstatic to be able to “eat” themselves. There was even a little computer cookie with my blog’s name, The Link Fairy displayed! I was totally blown away with the attention to detail that was put into decorating these cookies. Each Cookies By Design franchise is locally owned and operated so it’s the hard work of the owners and employees that are striving to make these amazing cookies so special. The bouquet we received was a theme offered by Cookies By Design called Book Worm, but the owner of the Madison, WI store decided to make the bouquet extra special by including my children’s likenesses as well as my blog into the treat! What a great way to surprise your friends and family, not to mention the perfect way to make a lasting memory. Besides looking absolutely awesome, the cookies themselves were each wrapped to retain freshness and smelled amazing! And let me tell you, the cookies tasted just as good, if not better then they looked. Cookies By Design cookies have a distinct almond flavor that just tantalizes your taste buds and their frosting has the perfect amount of sweetness. If you’re looking for custom created cookies, your local Cookies By Design is the best place to start! You can find your favorite bouquet online and then contact your local store to have them create your customized treat. Use a basic design as it is or ask for custom created cookies to spice it up and make it your own! When it comes to gift giving, there’s nothing more unique than sending a custom created Cookies By Design Cookie Bouquet! They look amazing, they taste outstanding and they are one gift that will always be remembered. With Summer here, graduations going on and Father’s Day next week, Cookies By Design is the perfect idea for all your special occasions! Contact your local Cookies By Design franchise and let them know what they can bake up for you! Lots of great out of school options to choose from! Be sure to follow Cookies By Design on facebook and twitter to stay up to date on the latest products and promotions. Make sure to also follow Cookie By Design, Madison, WI on facebook if you’re local to stay up to date on their latest news and products.